In this post, we’ll take a look at why and when you can use pricing tables, and do a quick walkthrough of a free app that allows you to add pricing tables to your Shopify store. 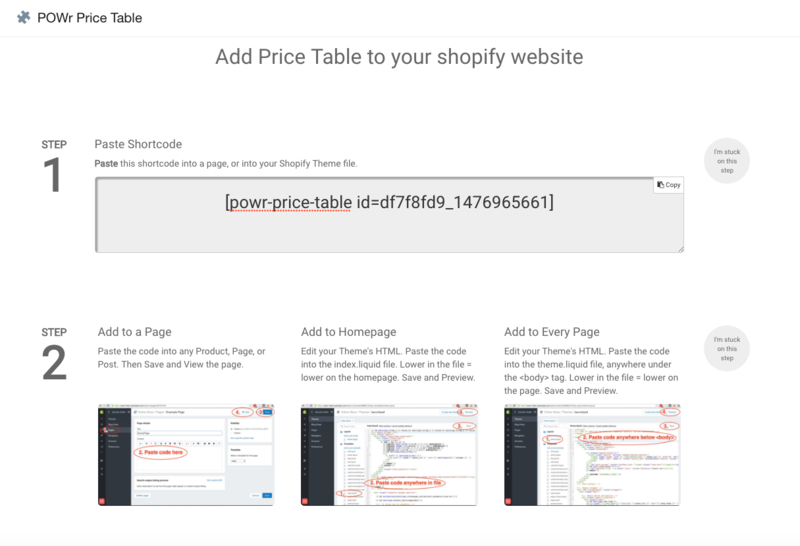 Pricing tables on Shopify: Why use them? If you have distinct products, then you’re probably okay using the traditional product pages to list all the features. For products that are similar, you can create a better customer experience by including a pricing table that displays the price and features for each of these products. You can use the free version of the POWr Price Table app to create a responsive pricing table for your store. Once you create the table, you can add it to any page on your store so that it fits in with the user journey. The “Edit Price Table” button is only shown when the administrator is logged in to provide an easy way to make changes. 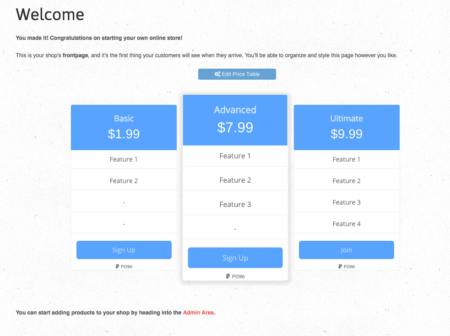 In our example, the Advanced plan is highlighted to anchor pricing. Now, let’s go through the steps to get to that final state. Once you install the app, a table example is already created so that you’re not building from scratch and you can see how to change different elements. You can then modify content, call to action, styling, highlighted plan, and more without modifying a single line of code. On the left sidebar, you can expand to see the elements within each plan by clicking on the three stacked bars for each plan. You can also add more plans as needed. For each, you can add/modify the number of features and the for each, whether it is highlighted or not, and what the call to action button displays and does. This should give you the final version of your table. Once you save and generate the table, you can add it to your store through a number of options based on where you want to display it. First, you will get a shortcode that you can add to any page through the rich text editor. Based on your theme, you may have to add the code to your theme’s HTML for certain pages. You can also display the table on every page of your site by adding it to the theme.liquid file. And that’s all there is to it. 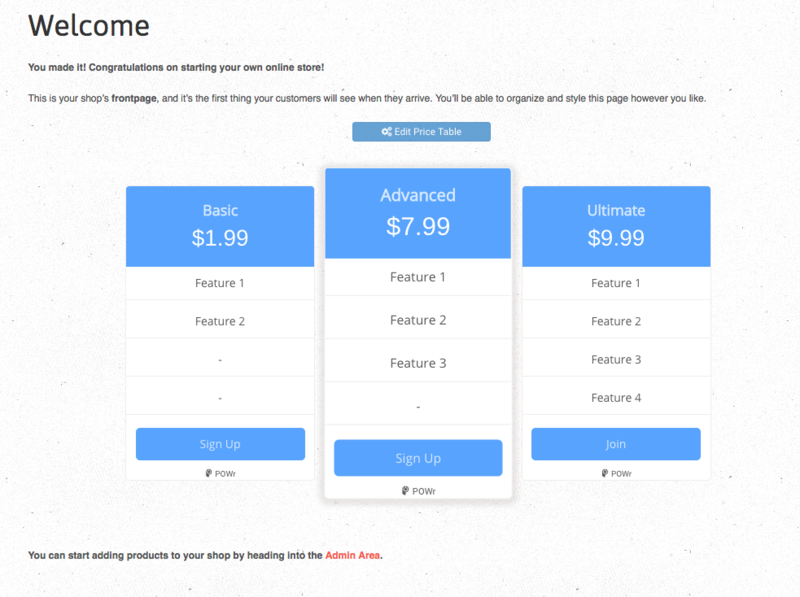 Once published, the pricing table is displayed on your store. You can add a free pricing table to your Shopify store that makes it easy for customers to compare your products or services. 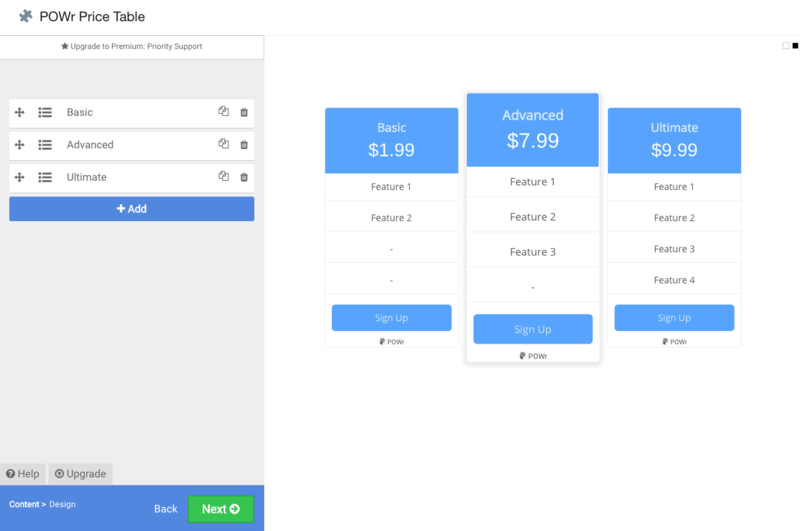 Pricing tables provide an at-a-glance view of similar products or services that have different features. You can also highlight a specific plan to provide the recommended or most-popular version. This can help guide customers to form a baseline for the features they should purchase. The POWr Price Table allows you to add a pricing table to your store for free. You can get additional features and more options by upgrading to a premium version of the app. You can customize the table – add desired number of columns, change styling, select plan to highlight – and easily add it to any page using a shortcode. Where you can’t add it via shortcode, you can add it in the HTML of the page. Are you using a pricing table? How have you constructed yours? Tell us in the comments below.